Hi Everyone - second up in our Contributors Reading Series is Russell!! Congratulations to our 2 winners through the Goodreads Book Giveaway contest; Jaimee & CJ will be receiving a copy of our Special Edition Hardcovers. And please, if you have read The20Project please send us your review! Hey Everyone, The contributors are putting together a video series where we read an excerpt from each of our chapters and share them with you. Someone has to go first! So, that person is me. Also, please remember to check out The20Project on Goodreads and a variety of other retailers. You can find more information on our STORE page. Hardcovers are here and they are beautiful!! We are so excited today, the HARDCOVERS arrived! We opened up the boxes and they are absolutely beautiful - so happy that all of the effort on this was really worth it. So...... of course I enlisted Margaret and we finished packing up all of the kickstarter rewards for mailing out. Tomorrow morning, we will be shipping everything! There are some surprises in the mail for some of our supporters and we hope that you enjoy your rewards. We couldn't have done this without our Kickstarter backers - THANK YOU!!!!!!! This weekend we had 2 articles published about The20Project. The first was in the Douglas College paper called "The Other Press" and the second was in the North Shore News! Both articles are reproduced below with links to the online stories! Turning 20 can be a tough time for young people as they struggle with the quarter life crisis, in which they question their life choices in their 20s, similar to the way adults re-evaluate their lives during a midlife crisis in their 40s. North Vancouver author Hilary Curry hopes to make the transition from teens to 20s a little smoother with her new book, The20Project, to be released November 1. In the book, she and 19 friends share advice and personal stories intended to help young people at that stage in their lives. The idea for the book came about in January when Curry was speaking with young people about the difficulties they’d gone through during their quarter life crises. She said some young people told her she seemed to really have her life together, which she admits isn’t entirely true but has motivated her to share her story. The book’s authors range from their late 20s to late 50s, which allows for a variety of advice and stories from different age groups that resonate with young people. Curry launched The20Project Kickstarter campaign in September with a goal of $5,000 to cover publishing costs, ending with more than $5,500. “This has been a nail-biting experience, but we have surpassed our goals,” she wrote on The20Project Kickstarter page. Since the book is about imparting wisdom to a younger generation, Curry and the other contributors decided to make it not-for-profit with proceeds going to support an African charity, Makomborero, where one of the book’s contributors, Nicola Holden, sits on the board of directors. The charity supports high potential students in Zimbabwe, selecting eight students a year to see them through their A-Levels (secondary school education). The20Project’s official book launch will take place on November 5 at the Ferry Building Gallery in West Vancouver. The event will feature wine tasting, gift baskets, books for sale, and special guest speaker Margaret Benson, a double-lung transplant recipient who will be sharing her story. "Everybody has a story to tell," says Hilary Curry, who in a new book project sought to channel those of a diverse group of adults, asking contributors to reflect on their personal experiences in an effort to help 20-somethings be inspired to find their way. The20Project, being released this weekend, is a compilation of stories written by 20 people living around the world. Curry, a 35-year-old North Vancouver resident, is the non-profit project's founder. She got going with the initiative in January after coming to realize the challenges faced by a number of her cousins in their 20s, some of whom are feeling lost and floundering somewhat as they try and figure out what steps to take in their lives. A further motivator were discussions she'd had with younger adults last year while travelling in Hawaii. Those a decade her junior were vocal about how impressed they were with how her life seemed so put together, something Curry felt compelled to explain was not always the case and share her own story. "I think for me, I was just like everybody else," says Curry, reflecting on her own period of struggle in her 20s. After embarking on her undergraduate degree in 1996, she made it through two years of study before dropping out. "I just had no direction, I didn't know what I was doing, and I moved to Australia," she says. It ultimately took her nine years to finish what she'd started, first taking outdoor recreation and then completing her bachelor of tourism management at Capilano University in 2005. Today she works as a management consultant for PeopleFirm. She is often called upon by friends and business associates to have mentorship conversations with their young adult children. Curry viewed The20Project as a means of reaching even more people and offering advice to those experiencing what's commonly referred to as a "quarter life crisis." "A lot of kids have grown up with the ideology that anything is possible," she says. "And yes it is, but today we've got more choice than ever before. Back when our parents grew up there were a couple of life paths that people chose and kind of followed. Yeah, there were still some people who were lost - and there's always a bit of that in every generation - but I think now, today, with all of our technology, the speed of everything and just everything that's going on, we've come to a point where there's just too much choice and people are just like, 'I don't know what to do because I'm good at a number of things.'" Curry reached out through her networks for interested book contributors and the resulting list includes a number of North Shore residents. Publication of the book was financed through a successful crowdfunding campaign and proceeds will support Makomborero (makomborero.info), a United Kingdom-registered charity that works to relieve poverty in Zimbabwe, Africa, through the education of children. "I don't think something like this is for the purposes of making money," says Curry. "I think something like this is for the purposes of giving back. I've been given so much in my life by people, even random acts of kindness from other people. So I really felt like this was a project that if we're going to give back to people, let's give back all the way, not partially." Makomborero was suggested as the book's beneficiary by London, United Kingdom-based contributor Nicola Holden who was born in Zimbabwe and sits on the organization's board. While The20Project is geared towards 20-somethings, Curry hopes its message of inspiration will speak to all ages, and that it proves to affect change in one way or another - big or small - helping readers experience personal and professional growth and success. "Honestly, at the end of the day I hope that something in the book allows somebody to get through - maybe they're going through a dark time, maybe they just feel like they're alone. ... I just hope the book impacts somebody's life to make better decisions or learn from our experiences. If it can do that, then it's served its purpose," she says. A book launch is being held Nov. 5 at the Ferry Building Gallery in West Vancouver. The event will feature a presentation by guest speaker Margaret Benson, an inspirational double lung transplant survivor, and students from Makomborero. Community members interested in attending can contact Michelle Arduini, at arduini. michelle@gmail.com. 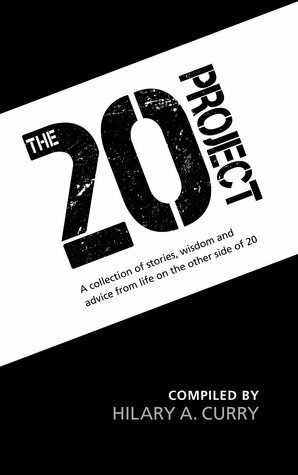 For more information on The20Project, including how to obtain a copy, visit the20project.com.